Vanessa Centeno is a conceptual artist living in New Orleans. She obtained her master of fine arts from the University of New Orleans in 2014 and her bachelors in fine arts from the San Francisco Art Institute in 2005. She is currently a member of the artist run gallery collective The Front. Her observation of the consumer world and America’s obsession with the slick digital convenience gives a window in which she investigates and probes modern dilemmas. Centeno finds herself attracted to glimmering synthetic forms and arranging them with meaning in her colorful compositions. She uses painting, sculpture and video mediums to understand the impact and relevance of our material world and to push beyond the preconceived notions of labels and question how they function and dysfunction in society. Summer Crush explores the colorful foliage of spring and summer blooms and the American themes of summer vacation. The sunny season is a time to cool off, relax and enjoy the beauty of a tropical summer-scape. In this body of work I am influenced by the glossy images of vacation fun in the sun and the brightly colored malls and glittery magazines. It seems like a good time to escape the dilemmas of painting and fall in love. I wanted to give my paintings a vacation and have some fun under the sun and to be vitalized again. I guess I gave them a trip to explore there inner lush. I hope they find love or at least look like they did. I treat each painting as a glimpse, where details and nuances are often perceived quickly. I find a rhythm in the landscape, which I use to make connections between forms and create a flow across the painting. These works are primarily interpretations of the feeling experienced in the landscape. Color, form, and light can often become heightened or distorted to evoke a feeling in the landscape. Stephen Rooney was born and raised in New Orleans. He has a BFA in Painting from The Maryland Institute College of Art, and has attended The Art Students League of New York, and The University of Minnesota's Fine Arts Program. 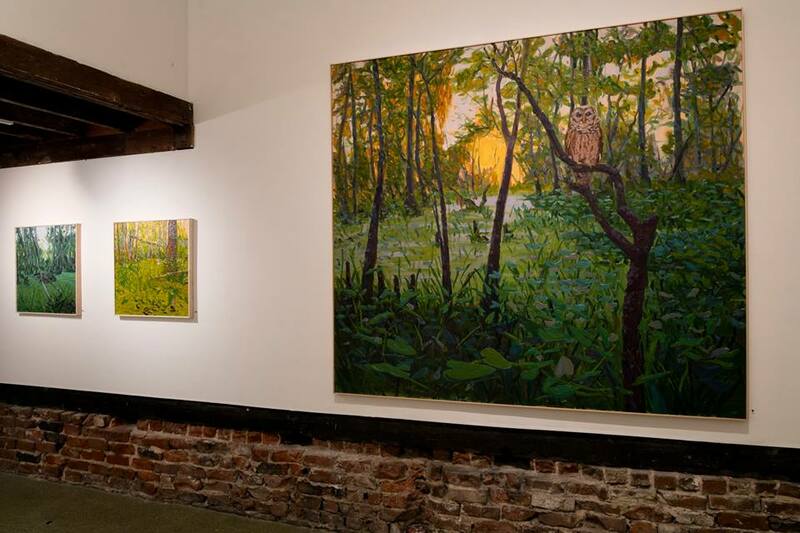 Rooney's current works are reflections of the Barataria Preserve, (protected swamplands south of New Orleans). Although He grew up in New Orleans, Rooney was never exposed to this Marshland. It wasn't until 2011, after moving back to the city, that he was able to gain a new respect for this place. The swamp intrigued Rooney, as he describes, "Many locals may not consider visiting this place during the summer, it's mosquito infested, banana spiders cover the trees overhead, there are also many snakes and poison ivy to stay clear of. However, summer also allows the marsh to thrive with life, and the color becomes very rich. Irises begin to bloom, along with the spider lilies, and water hyacinths. The dense, unruly growth is also very inspiring." This lush, dense landscape, is what drives Rooney to create his works. His loose, bold strokes, and vibrant color speak well to this exuberant landscape. Appetite is a basic premise of humanity. We distinguish ourselves through taste, not simply what we crave or find disgusting to consume, but as a way to elevate our character or transform sociologically. Seen through this often rarified cloud, satisfying hunger becomes a primal factor of survival rather than an aesthetic experience. These works are about desire, the kind of hunger that is gluttony. Anxiety results with how to deal with the embarrassing amount chosen to devour, a quantity that is impossible to ingest. Overabundance has a distinct visual and psychological pull. The attraction of fleshy and grotesque objects is simultaneously gross and fascinating. Entwined into a pattern, an abject wallpaper, we feel and see infinite satisfaction. Claire Rau was born in Sandusky, Ohio and raised in northeast Tennessee. 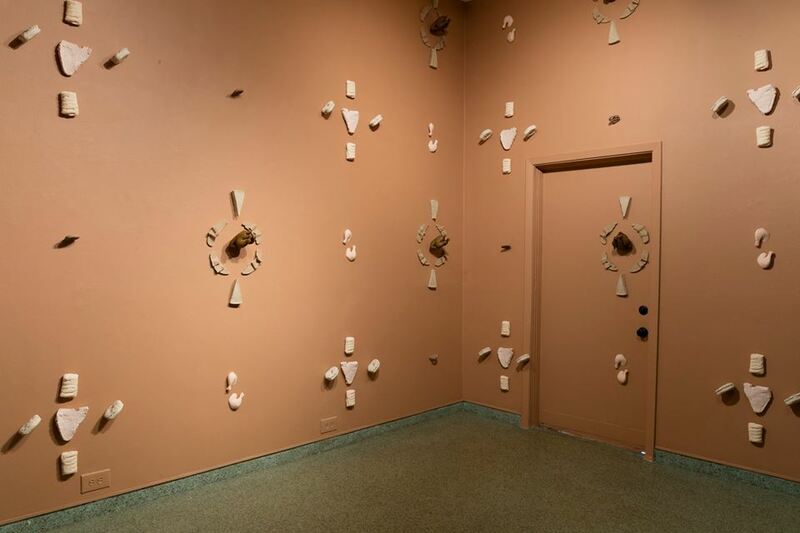 She completed her graduate work at the University of North Carolina, Chapel Hill (2004) with the installation Body Plunder. She has taught printmaking and sculpture at several institutions and presently teaches sculpture at the University of Colorado, Colorado Springs. She is the recipient of several awards and residencies, including the Book Arts & Printmaking Fellowship at the Scuola Internazionale di Grafica (Venice, Italy) in 2005. Claire has exhibited in the US and internationally including MASS Gallery (Austin, TX), Breve Gallery (Mexico City, Mexico), Biggin Gallery (Auburn University, AL), Lump Gallery (Raleigh, NC), and Open Studio (Toronto, Canada). She is a founding member of an artist run collective in New Orleans, The Front. There is no knife connection is a body of work wrapped around visual memories and histories, anamnesis through image, and the omnipresent, unknowable, and infinite versions of human experience contained in public and private spaces. Man's hybrid environment of things grown and things built (architecture reacting to nature and vice versa) is a part of the story that exists, and acts as a record in some ways. But to us it is only comprised of what we've seen with our own eyes and remember in the folds of our own brains. That fact that we don't remember something does not mean it is not part of the story, that it didn't happen in this very spot, that it never looked that way, that it never appeared like that in a dream. Our visual memories are constantly being altered, layered, cut away, merged, and reimagined by ourselves, by time, and by outside influences; the works you see here are further reconstituted visions from my past and present. We recall what we believe, and believe what we recall - nothing is ever finished or truthful. There are always loose ends that will never be tied, but instead knotted on top of themselves over and over again in perpetuity. Remember? Madeleine Wieand was born in 1989 in Philadelphia and received her BFA in Photography from Pratt Institute in 2012. She works primarily in photography and printmaking, and recent work has included textile media. Her work is about people and cities, and she has shown her work to people in cities including Philadelphia, New York City, Minneapolis, New Orleans, Mexico City. She is an artist member of The Front.